The Husqvarna 350BT back pack blower (see larger image). With its 2.1-horsepower engine and maximum power speed of 7,500 RPM, this blower is able to generate wind speeds up to 180 miles per hour--enough to blow away even the most stubborn yard waste. 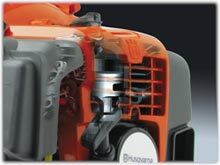 Husqvarna's patented 2-stroke X-Torq engine technology gives you more power when you need it, and with up to 20 percent less fuel consumption and up to 60 percent less emissions (when compared to a standard 2-stroke engine). 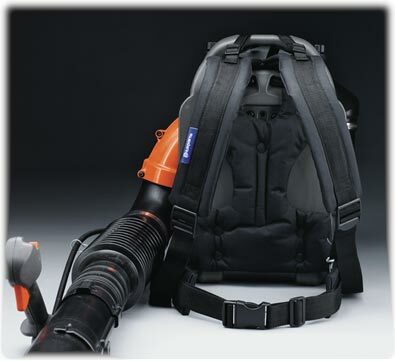 Comfortably designed for hours of use, the 350BT features an integrated harness that's ventilated and helps reduce load with a hip belt that's shaped to fit the contours of the operator and wide shoulder straps. The handle has an easily adjustable soft grip for optimal maneuvering. Its high-volume 42.27-ounce tank can sustain hours of use. 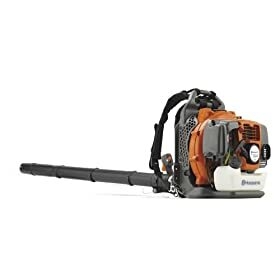 It also features a cruise-control function that maintains a constant fan speed, allowing you to complete big jobs without having to constantly regulate your blower's speed. 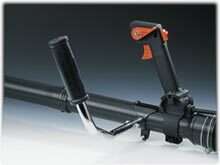 Other features include a an easily adjustable soft-grip handle, intuitively gathered controls, and an air purge function that removes air from the carburetor and fuel system for easier starting. It's backed by a 2-year limited warranty. Comfortable, ventilated and load-reducing harness (see larger image). Great yards demand equipment that is as dedicated and hardworking as you are. Fortunately, Husqvarna's range of garden equipment offers everything from lawnmowers and snow blowers to trimmers and chainsaws that let you master your slice of the great outdoors. With Husqvarna, it's easy to make your yard the envy of the neighborhood. Founded in Sweden in 1689, Husqvarna is one of the world's oldest companies.